Cellfeee via eBay offers the Refurbished Unlocked Apple iPhone 7 128GB GSM Smartphone in several colors (Jet Black pictured) for $319.99 with free shipping. That’s $5 under our mention from six days ago, a low by $74, and the lowest we’ve seen for an unlocked unit in any condition. Notes: There’s no clear warranty information. 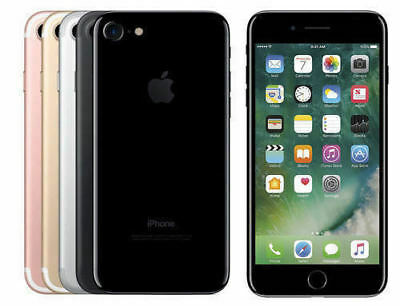 This Apple iPhone 7 128GB GSM Unlocked Smartphone has been determined fully functional by our industry leading functionality inspection. It will show signs of wear like scratches, scuffs, and minor nicks on the screen or body. This item will NOT come in its original packaging but will include a certified cable and UL approved power adapter. Headsets, SIM card and manual are NOT included. This Apple iPhone 7 128GB GSM Unlocked Smartphone is fully functional with T-Mobile, AT&T and all other GSM networks (does NOT WORK with Metro PCS!). It will NOT work on Sprint, Verizon, Boost, Virgin Mobile or any other CDMA network. At this time Cellfeee via eBay also offer Open-Box Unlocked Apple iPhone 7 128GB GSM Smartphone in several colors (Black pictured) for $399.99 with free shipping.